All of our processes are carried out by skilled and trained engineers. Before your fabrication is delivered to your chosen site, we ensure that it is finished to the highest of standards. 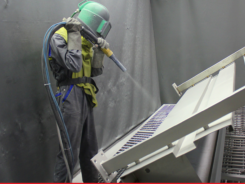 We have invested in a walk-in recirculating shot blast room, which uses steel grit to clean the fabrication. Shot blasting is ideal for removing paint, deburring, eradicating sand from castings, and provides an excellent key for painting. Shot blasting also removes any scale left behind after heat treatment. We believe in quality in everything we do, and to support this, hold quality management accreditation to ISO 9001: 2008. In 2015, the Tamworth steel group were awarded CE Accreditation to BS EN 1090-1 for structural metalwork. In addition, our shot blasting services operates to BS EN ISO 8501-1: 2007 (SA2.5) Surface Preparation Standard. If you have a project that you would like to discuss with us, or would like any information on our range of fabrication services, why not give us a call on 01827 53231, or complete the contact form on our website.